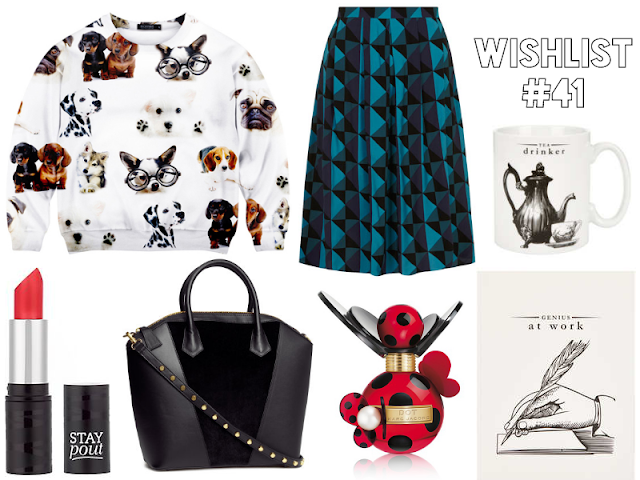 Doggie's Print Sweater - Okay, so every once in a while I get a crazy want. This is it. My boyfriend knows fully well know how obsessed I am puppies right now and have sent him countless puppy photos. So I'm sharing my love of doggies with you after I saw this sweater on Romwe. I can't believe they make crazy stuff like this for crazy people like me! This would be strictly a chill out sweat if it ever came into my possession. Blue Geometric Midi Skirt - I first set eyes on this beaut when I was reading Look magazine at work this week. I tracked it down online and think the print is just beautiful and the colour works so well. I'm liking that skater style midi skirts are in because I'm not too good with the tube ones. Tea Drinker Mug - It's getting colder again, and tea is becoming a more common drink than it was before! I think I'd like this mug because it looks simple and smart. The perfect work mug really! Seventeen Stay Pout - After reading Kirstie's post on these new bad boys by Seventeen I really really want one. In most of the colours... Someone help, I think I have a lipstick hoarding problem. Boots are going to ban me from there soon. Faux Leather & Fur Handbag - I'm on the search for my next new bag. I've been using the same one for the last year almost and it's starting to fall apart slowly. I don't want to get rid of it because it was present from the boyfriend and I want to be able to use it again later on. I've got my eyes on this one at the moment. I attempted to find another one on the H&M website that I saw in Look that was pink and gold but I couldn't find it. I like this one though for the zips, simple detailing. All you need! Marc Jacobs Dot - Everyone raves about this perfume and every one that comes out after it! I want to try it out, and I haven't been able to smell it yet. What does it smell like ladies? And would you recommend it? Genius At Work Notebook - I love a good notebook. And the quote is a bit big-headed and cheeky but I like it that way. I'd love to use this at work on my lunch breaks for blog notes and what not. It would match my mug nicely... Haha! Share a wishlist that you've posted on your blog with me. I love reading them as much as posting them! i love the doggie jumper. its soooo cute- i bet its sooo cosy and comfy. i really want to get it now. haha. Love the skirt and the bag, so gorgeous!